Yes, this episode of Modern Family is called "Daddy Issues." The writers really did think that was a good idea. But these are the same people that have been writing for this season of Modern Family, so I shouldn't be surprised. It's Phil and Claire's anniversary again (even though it was in the fall one season and in the winter in another), and this time it's Phil struggling when it comes to an anniversary gift, not Claire. After an unsuccessful mall trip, Phil tries to get Joe to figure out what Claire got him, and there is a hilarious moment where Claire blew an air horn at the phone strapped to Joe, and he shouts "Why would you do that? My ears are still developing!" Joe has been the biggest delight recently, impressing while other parts of the show have been disappointing. There was also a funny moment where Phil answers the phone while it's still strapped to Joe. The gift that Claire has for Phil turns out to be a night in their old apartment. It's really nice to see something that was important to their life in the past, and it's great to see Claire excited about getting Phil such a good gift. In the end, Phil does get to help, as when things begin to go very wrong, he cleans it up. It was a sweet moment for the two of them, both contributing to a wonderful night. There was also a funny joke in the tag where the mop that Phil got can do everything, except mop. After an initial scene that doesn't do a very good job of introducing viewers to the story with Mitch, Cam, and Lily this week, a meeting with a teacher at Lily's school causes Mitch and Cam to realize how puberty is affecting Lily, and how they are not totally prepared to handle that. 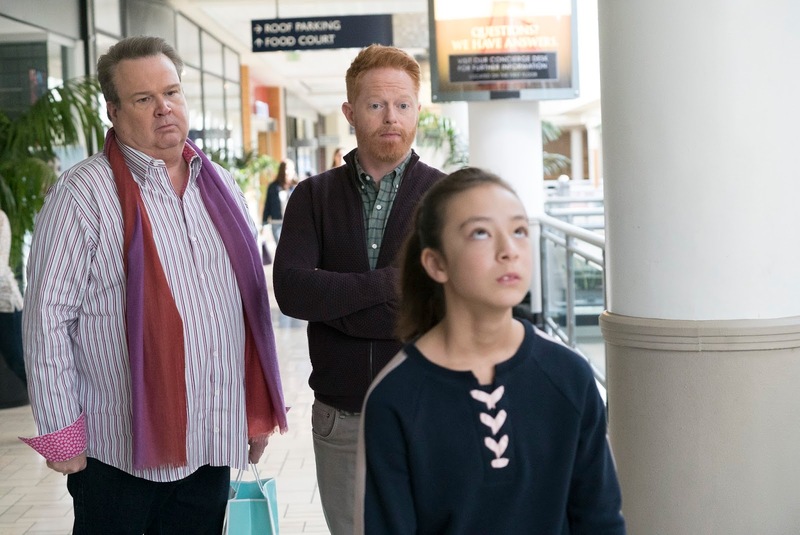 This is an interesting topic for Modern Family to explore, Lily going through puberty when she has two dads. Mitch and Cam worry that straight parents have strengths that they do not, but there is a funny twist here when Lily's friends turn out to be interested when the two provide advice on how to get a boy's interest. When a former boyfriend of Gloria's visits who she was seeing while she was with Javier, Jay notices that he looks a lot like Manny. When Alex stops by the house, she makes the same observation, but neither Manny nor the ex seem to notice. Gloria gets home, and she mistakes her ex for Manny. Jay and Gloria talk about the possibility of this man being Manny's father, and Alex shows up with test results that show that he is. In a twist, it turns out that this was all an April Fool's joke planned by Gloria. I don't believe that the show has every done April Fool's before, so I liked that they did it here, and it was believable that Gloria would go to great lengths for a joke. The best part here though was everyone else's reaction to how far Gloria took the joke. Nothing about this episode completely stood out, but each story had its enjoyable moments. An interesting topic was explored with Mitch and Cam, and April Fool's was a funny thing for the show to explore, even if the story wasn't that interesting leading up to that. What did you think of "Daddy Issues"? Leave your thoughts in the comments!